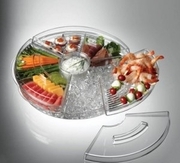 Keep hors d'oeuvres chilled and fresh for hours over a bed of ice. The revolving tray keeps appetizers chilled over a bed of ice so they stay fresh and tasty. Fill the deep bottom tray with cubed or crushed ice and position the 3 upper food trays above. The double compartment food trays have vented bottoms to allow the coldness from the ice to flow through. A handy removable dip cup is also inclucded. Each upper food tray and the dip cup have their own attractive lid to keep the cold in and the bugs out. Great for indoor or outdoor use, for a variety of foods. Bottom tray can also be used without ice as a big chip and dip serving platter. Made from durable crystal clear acrylic with tough polycarbonate dip cup and revolving base. 16-1/2"dia x 5" h overall.